BetterYou Magnesium Oil - Pure Mineral Spray has been specifically formulated to be gentle on sensitive skin. As this oil is absorbed through the skin, it`s the ultimate way to replenish magnesium levels. Magnesium is a vital mineral with many therapeutic benefits. It helps promote overall wellbeing and relaxation, skin health and skeletal strength. Applied directly to the body, Magnesium Oil Sensitive spray delivers this essential mineral directly into the skin tissue, efficiently replacing magnesium faster than traditional oral supplementation. 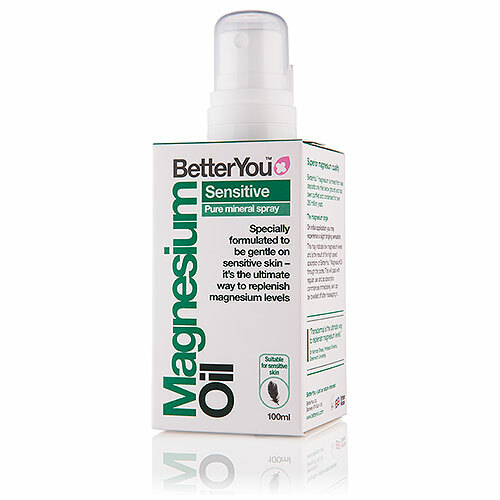 BetterYou Magnesium Oil - Pure Mineral Spray has been dermatologically tested and formulated specially for sensitive skin. 10 sprays deliver a minimum of 75mg (21.5% RDA) of optimally absorbable elemental magnesium. In BetterYou Magnesium Oil - Pure Mineral Spray - Sensitive spray you will find a concentrated solution of Zechstein Inside® magnesium chloride (15% magnesium chloride). Suitable for those who are on vegan, vegetarian and coeliac diets. Suitable for any age, for children under 12 halve application. Magnesium Oil Sensitive spray is also suitable during pregnancy and breastfeeding. Below are reviews of BetterYou Magnesium Oil - Sensitive Spray - 100ml by bodykind customers. If you have tried this product we'd love to hear what you think so please leave a review. I don't like it as it makes my legs and feet sticky and catch on the bedding.